Breath changes, when you change your breath direction from blow to draw or from draw to blow. Hole changes, when you move to a different hole by sliding the harp left or right in your mouth. When you move from one note to another, you often need to simultaneously change breath direction and move to a different hole. Keep the harmonica in your mouth. Breathe for the full length of the note. Find Blow 4 and play it, making sure that you have a clean, isolated single note. Sound Blow 4 and then inhale to play Draw 4. Changing the shape of your mouth opening. Try keeping your lips from moving or changing shape when you change from exhale to inhale. Moving the harmonica slightly to the left or right in your mouth. Make sure the harmonica doesn’t move in your mouth when you change breath direction. Alternate back and forth between Blow 4 and Draw 4, striving for a clean single note at the beginning of each new breath. When you can play clean breath changes in Hole 4, try breath changes in other holes, such as Holes 5, 6, and 7. Play Blow 4 and sustain the note. As you exhale, use your forearms to slide your hands and the harmonica to the left until you hear the note in the neighboring hole (Hole 5). If you hear Blow 4 and Blow 5 together, move the harmonica a little farther to the left until you hear only Blow 5. If you go past Hole 5, you may hear Blow 5 and 6 together or even go all the way to Blow 6. Try moving the harp slightly to the right until you hear Blow 5 by itself. If you need to take a breath at this point, try dropping your jaw with the harmonica resting on your lower lip, taking a breath, and then raising your jaw to resume playing. When you get a clear Blow 5, move the harmonica to the right again until you hear a clear Blow 4 again. Alternate between Blow 4 and Blow 5 several times. Now try alternating between Draw 4 and Draw 5. When you move to a neighboring hole, listen to the transition between notes. Aim for hearing one note and then the next, but not the two together. This can take some careful practice. When you master making a smooth, clean hole change between Holes 4 and 5, try extending your new skill, which takes you through hole changes in Holes 4 through 7. As you move the harmonica to the left to reach the higher-numbered holes, you may experience some reluctance to move in that direction, as if the harmonica were attached to a rubber band pulling you back to Hole 4. To overcome that reluctance, try getting a single note and then quickly sliding the harmonica to the left and right in your mouth, going all the way from Hole 4 to Hole 10 and back several times. Don’t worry about which holes you’re playing; just let the harmonica glide freely to the right and left. When you can glide through hole changes, you can stop at each hole and add a breath change, alternating between blow and draw breaths before moving on to the next hole. At the end of every second measure, note the breath mark. You may need to take a breath at this point. 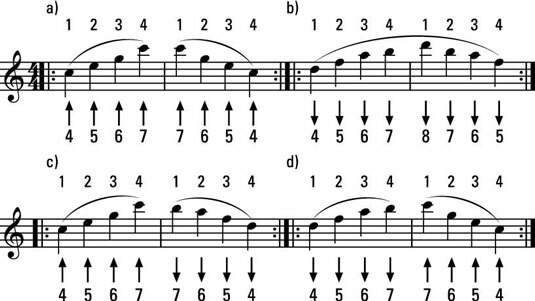 When you move to a neighboring hole, play both notes with a single breath so that you can hear where you’re going. When you change breath direction while you move from one hole to another, you stop making sound just as you make your move. However, if you’ve already made the hole change without changing breath direction, you have a memory of where to move. When you play a scale in the middle register, you often move between a draw note on the left and a blow note on the right. First you make the hole change without a breath change, and then you make the combined breath and hole change. Next, extend the same moves through the middle register of the harp. Sometimes a melody moves from a blow note on the left to a draw note on the right. 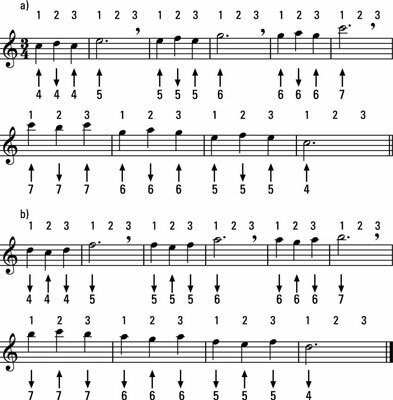 You sometimes need this move for melodies played in Holes 1 through 6, while in Holes 7 through 10, you need it to play the scale. This move starts you off playing this move on the harmonica in Holes 4 and 5. This move lets you try it out in all the harmonica’s middle register holes.